The founder of Buddhism in this world is Buddha Shakyamuni who lived and taught in India approximately 2500 years ago. To this day, millions of people around the world follow this spiritual path of meditation to experience a deep and unchanging peace of mind, enlightenment. Buddhism is a religion and philosophy encompassing a variety of traditions, beliefs and practices. It is largely based on teachings attributed to the Buddha meaning ‘The awakened one’. The Buddha lived and taught in the eastern part of the Indian subcontinent between the 6th and 4th centuries BCE. He is recognized by Buddhists as an awakened or enlightened teacher. He shared his insights to help human beings end suffering through eliminating ignorance by way of understanding and eliminating craving, thus attaining the highest happiness, nirvana. Nirvana is the experience that comes to a person when greed, hatred, and delusion are extinguished and enlightenment is gained. According to Buddhist traditions a Buddha (the awakened one) has completely purified his mind of the three poisons of desire, aversion and ignorance. A Buddha ends the suffering which unawakened people experience in life. There are two major branches of Buddhism: Theravada (“The School of the Elders”) and Mahayana (‘The Great Vehicle’). Theravada Buddhists strive to become perfect saints who have attained enlightenment and this is considered only possible for monks and nuns, who devote their entire lives to the task. Mahayana Buddhism, which emerged in the first century CE is a more accessible interpretation of Buddhism and is a path available to all people, not just monks and nuns. While Buddhism remains most popular within Asia, both branches are now found throughout the world. It is estimated that there are 350–500 million Buddhists. Buddhism has also influenced other religions such as Hinduism and Christianity. • The Sangha (the community). The Middle Way: the practice of non-extremism – a path of moderation away from the extremes of self-indulgence and self-denial. Truth, according to Buddhism, is to experience things as they are, without distortions created by emotions, thoughts, opinions and states of mind. The Noble Eightfold Path consists of a set of eight interconnected factors or conditions: Right Understanding, Right Intention, Right Speech, Right Action, Right Livelihood, Right Effort, Right Mindfulness, and Right Concentration. 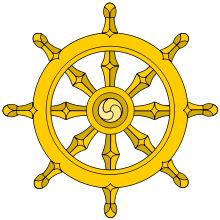 The Wheel symbolizes Buddha turning the Wheel of Truth. These eight factors are commonly presented within three divisions: Wisdom, ethical conduct and concentration. Karma: Actions and work. Good deeds and bad actions will determine a person’s future state of existence. Meditation: Buddhist meditation is fundamentally concerned with transforming the mind. Mindfulness and awareness are to be developed at all times. When one’s mind becomes calm, tranquil and purified of defilement one can obtain release from all suffering. The Four Immeasurables: love, compassion, joy, and equanimity. The Four Immeasurables are taught as a form of meditation that cultivates ‘wholesome attitudes’ such as happiness, freedom from suffering, freedom from bias, anger, and equanimity. Kadampa Buddhism is a Mahayana Buddhist school founded by the great Indian Buddhist Master Atisha (AD 982-1054). The Kadampa tradition was later promoted widely in Tibet by Je Tsongkhapa and his followers, who were known as the ‘New Kadampas’. Through the activities and dedication of the renowned Buddhist Master, Venerable Geshe Kelsang Gyatso, Kadampa Buddhism has spread to many countries in recent years. This is an ancient lineage that has been presented in a new way for these modern, busy times. Tushita Centre was founded in 2008 by Venerable Geshe Kelsang Gyatso and provides an inspiring environment in which people can learn about Buddhism and meditation. Everyone is welcome to attend the classes at the Centre and our branches around Cape Town. The Resident Teacher of Tushita Centre is Gen Pagpa. He has practiced Kadampa Buddhism for over twenty years and was ordained as a Buddhist monk in 1996. He has been teaching in and around the Cape since 2007.